Event: Gem & Mineral Carving Gift Show, from 11:00 am to 5:00 pm , Saturday, December 1st. Do you have a favorite gemstone or mineral? How about a favorite animal or sea creature that you collect? These finely detailed carvings showcase the skilled work of artists that know just how to bring out the beauty of the stone. Come by and browse this unique collection for that one-of-a-kind Holiday Gift. Bruce and Debbie Barlow have been in the lapidary business in the valley for over 30 years. 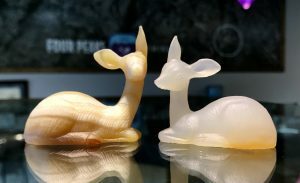 They have hand-selected each of these delicate carvings and will be offering them at special pricing during this Gift Show. Everything from sea turtles, frogs, lizards and deer to elephants and skulls, you will find the perfect choice for that hard-to-find gift on your list this year! 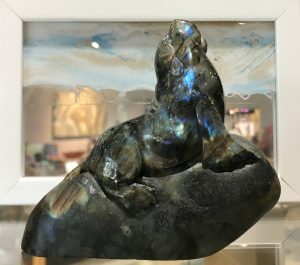 The mineral selections for these carvings encompass everything from Kambaba Jasper, a volcanic type of rhylolite from the South Africa Rift on the western side of Madagascar, to Kalahari Jasper from the Kalahari Desert in South Africa and even Fluorite from China and Mexico. 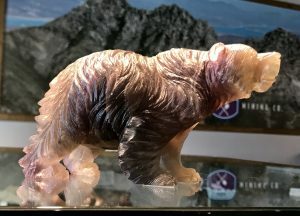 No matter what color or mineral, or even healing property you’re looking for, there’s a mineral carving just waiting for you to take home. 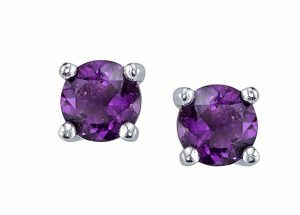 Special Gift with Purchase Offer: one pair of 4mm Four Peaks Amethyst & Sterling stud earrings with every first purchase over $50. Sign up to receive information regarding store events, sales and other happenings.